Dawn Reveals Recent Changes on the Ceres’ Surface. Very Active World. Dawn observes recent variations on Ceres’ surface. The spacecraft reveals that the dwarf-planet is a dynamic body that continues to evolve and change. Ceres is the only dwarf planet in the inner solar system. Astronomers previously found water ice in a dozen sites on Ceres through observations obtained by the visible and infrared mapping spectrometer (VIR) on the Dawn spacecraft. 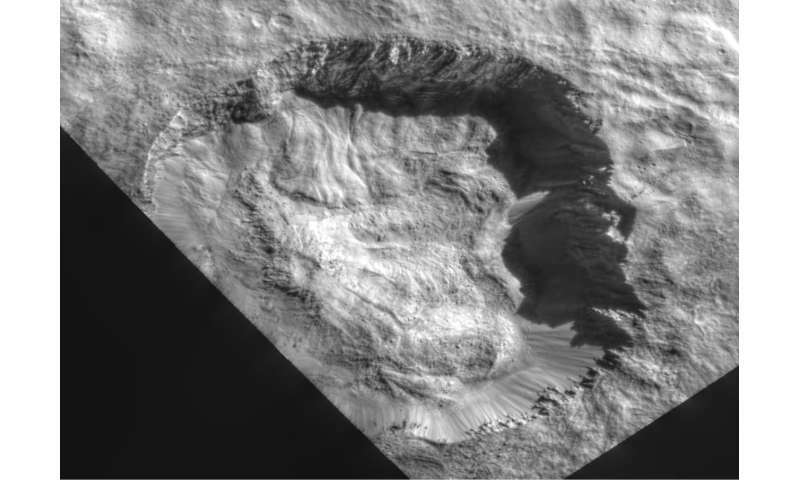 Now, a new study reveals the abundance of ice on the northern wall of Juling Crater, a crater 12 miles (20 kilometers) in diameter. “This is the first direct detection of change on the surface of Ceres,” Andrea Raponi, a researcher at the Institute of Astrophysics and Planetary Science in Rome, Italy, said in a news release. The new observations, conducted from April through October 2016, show an increase in the amount of ice on the crater wall. NASA launched Dawn in September 2007. It is a mission to the two largest bodies in the asteroids belt – Vesta and Ceres. NASA says these diverse worlds offer scientific snapshots of the birth of our solar system 4.6 billion years ago. Dawn is the first spacecraft to visit Ceres and Vesta and the first to visit a dwarf planet. It reached Ceres in March 2015, a few months before New Horizons flew by Pluto in July 2015. It is currently in orbit about its second target, the dwarf planet Ceres. However, Dawn has helped planetary scientists begin to understand the composition of the Ceres’ crust. Researchers believe Ceres’ outer layers feature organic deposits. With the help of Dawn, scientists were able to locate sodium carbonates among the 12 newly exposed sites. The study marks the first time scientists have found hydrated carbonate on the surface of Ceres or any other planetary body besides Earth. Thus, giving us new information about the dwarf planet’s chemical evolution. “Changes in the abundance of water ice on a short timescale, as well as the presence of hydrated sodium carbonates, are further evidence that Ceres is a geologically and chemically active body,” said Dawn scientist Cristina De Sanctis. Scientists detail Dawn’s observations in a pair of new papers, published this week in the journal Science Advances.